Before spring quickly turns into summer (and those hot, miserable 90+ temperatures) I wanted to make sure and share this lovely vintage spring tablescape I created for Easter. Yes, Easter, but you won’t see any cute bunnies or Rice Krispies Treats nests here. I do love to dress up the table for our family get togethers and add a little touch of elegance to even the most casual of gatherings. The last six months have been exhausting around here, beginning with two surgeries for my husband, the birth of our first grandchild, sudden death of my brother-in-law and our crisis with our teenage son. With all that going on who has extra hours to spend setting a perfect table? 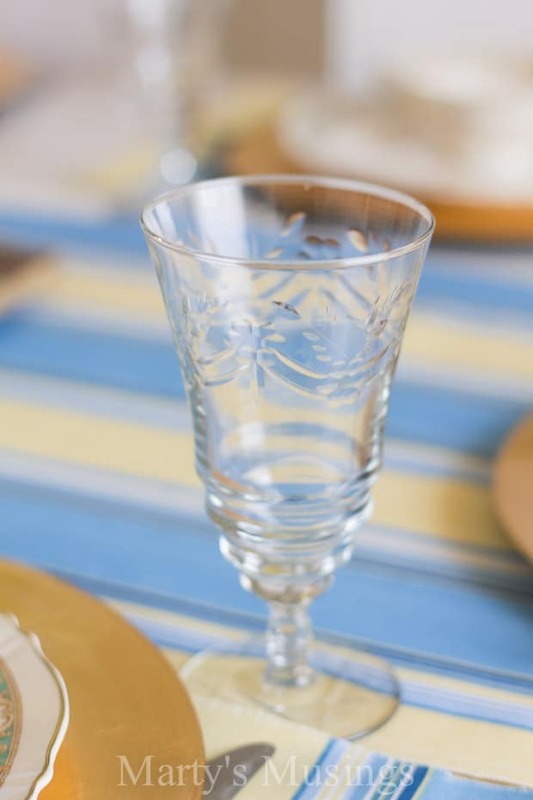 Not me so here are a few tips to make entertaining easier for all of us. I spent $12 on four bunches of fresh flowers at the grocery store and picked up a few miscellaneous ones around our neighborhood. What a difference a few flowers in glass jars and a bit of ribbon make! 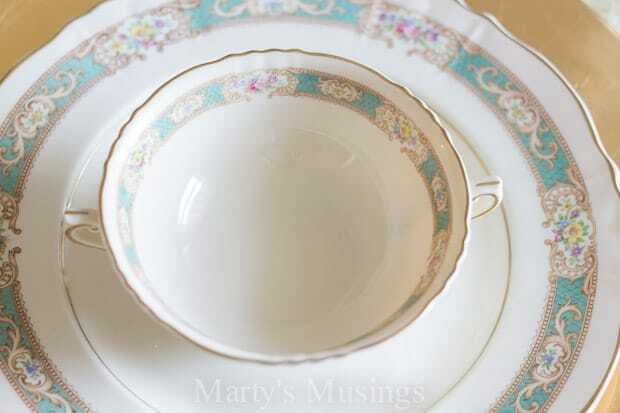 I have a setting for 16 in my mom’s china (so y’all can all come over for lunch!) and it’s one of my very favorite items she passed down to me, along with her crystal. I made the napkins and table runner out of leftover material from these no sew window treatments and shabby chic dining chairs.. I didn’t sew a lick but just free cut the fabric and ironed. Everything doesn’t have to be perfect! 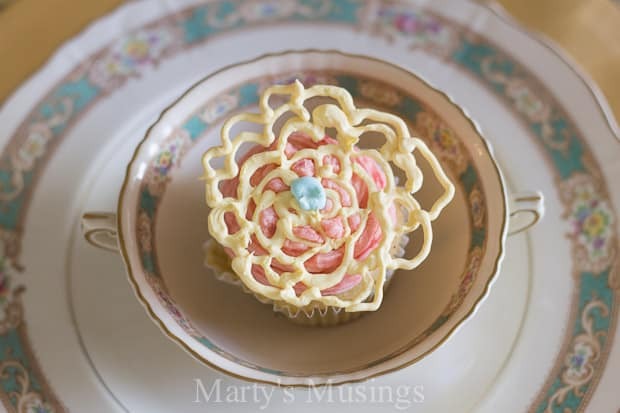 My daughter has been on a baking spree lately and for Easter she made these beautiful cupcakes and decorated them. They were as delicious as they were beautiful. 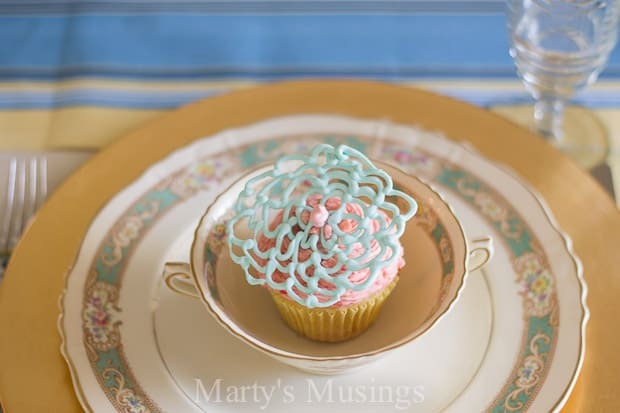 I used the matching soup bowl to my china to set the cupcakes in at each place setting. Would anyone like the recipe? 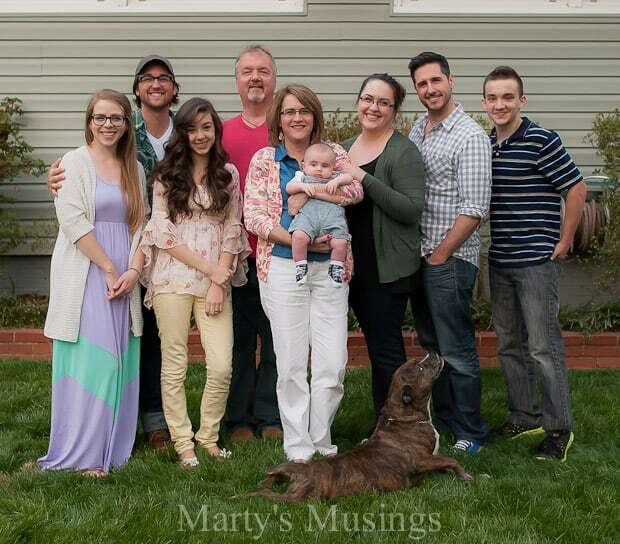 I might have to add her to the team here at Marty’s Musings! 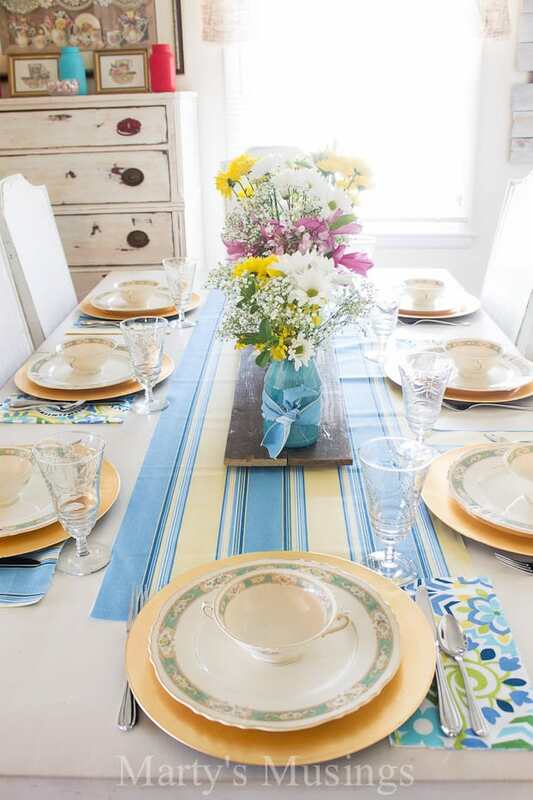 Setting a beautiful table doesn’t have to require a Herculean effort or a lot of money. Don’t wait until next Easter to celebrate with family and friends! That’s really nice and pretty, Marty! Are those gold charger plates? Looks really good with the china. 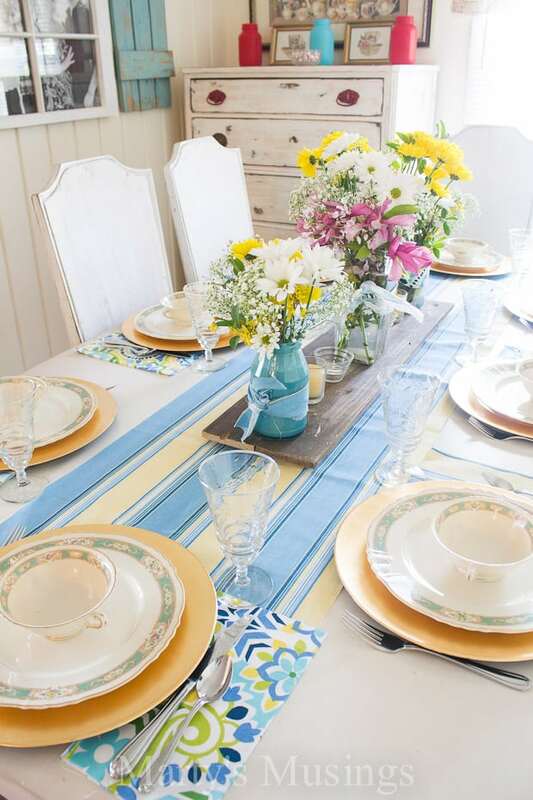 What a beautiful set-up; the colors just scream spring and summer! This table is stunning! 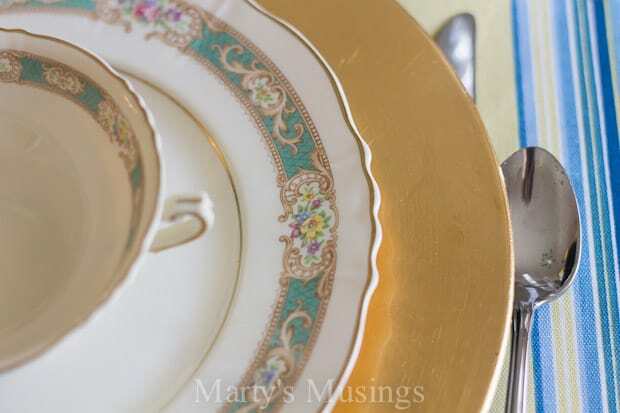 I love how you chose the china and incorporated the colors into this glorious tablescape. 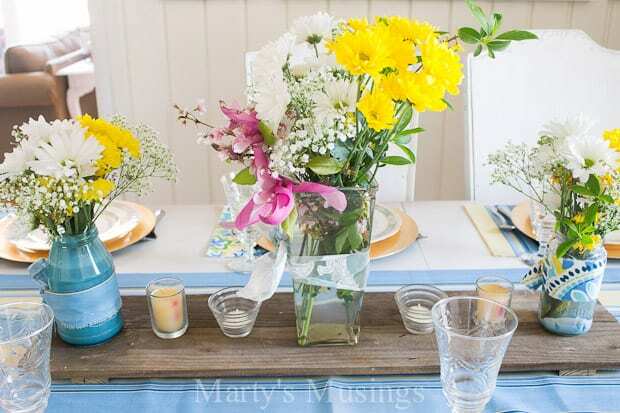 I saw this over at Work It Wednesday on Amy’s blog and was shocked by the beauty of your spring tablescape. You rock! I will stop by on facebook and say hi. 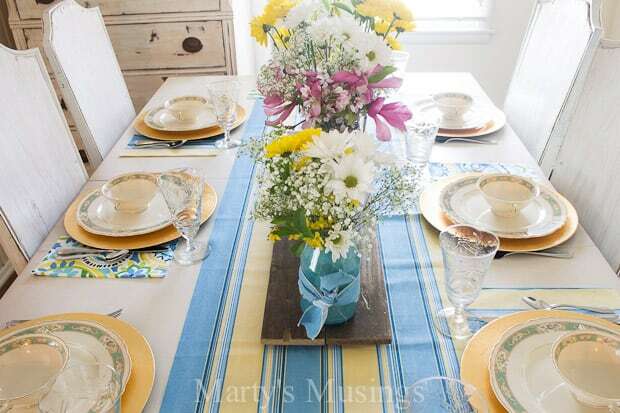 I love your table setting, especially the flowers and dishes! What pretty photographs. Thanks for linking up to Small Victory Sunday Linkup. Love the table! Your style is similar to mine (I guess that’s why I like it!). I am pinning to help remember your great ideas for a simple table. 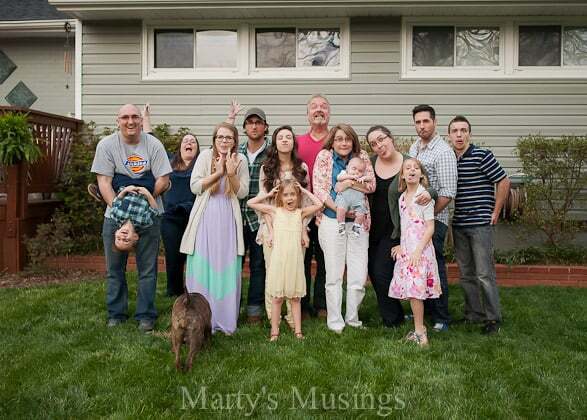 BTW, I love your family photo!! What a collection of good ideas you have bought to the #HomeMattersParty . 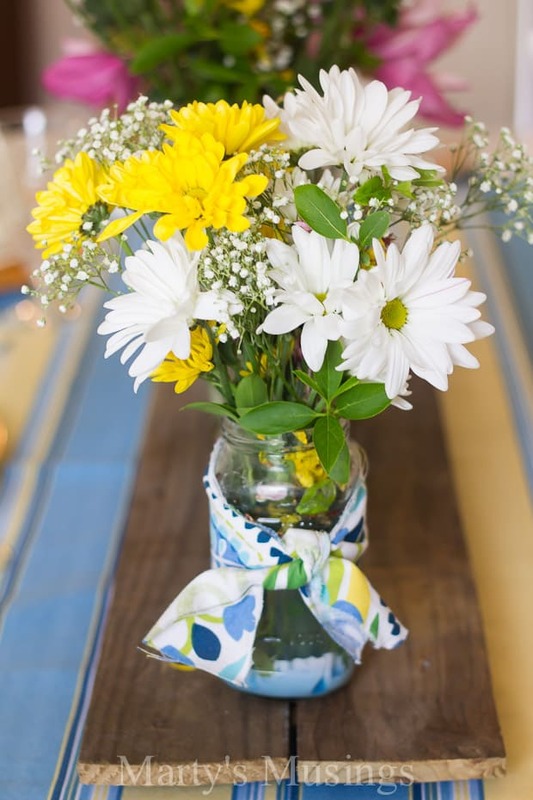 I would never have thought to put the matching cloth around the flower vases, that is such a great idea. The whole tablescape looks good. Lovely table scape! Thanks for sharing at the party! Hope to see you again this week. Pinned & shared. PS your china is & glasses are so pretty!